We awoke to birds chirping in the trees outside our room and the sun streaming through the windows. We enjoyed double expressos in bed as we checked the day’s routing including where the closest gas station was so we could fuel up. What a great way to start the day! We had agreed last evening to meet for breakfast at 9am. It seemed like we had just eaten and we were back at it again. We entered the quaint, Bistrot in the former kitchens of the 1750 building with the fire roaring and the sound of laughter in the air. Our Swiss friends had already arrived (it was 9:10) and started breakfast.Another double expresso kick started a delightful breakfast of homemade yogurt, granola, fresh fruit, pain au chocolates, croissants, French stick with pots of fresh butter and herb de provence omlette. Croissants and omlettes just don’t taste the same outside of France. After about 45 minutes on the road, we all pulled into the gas station to fill-up. 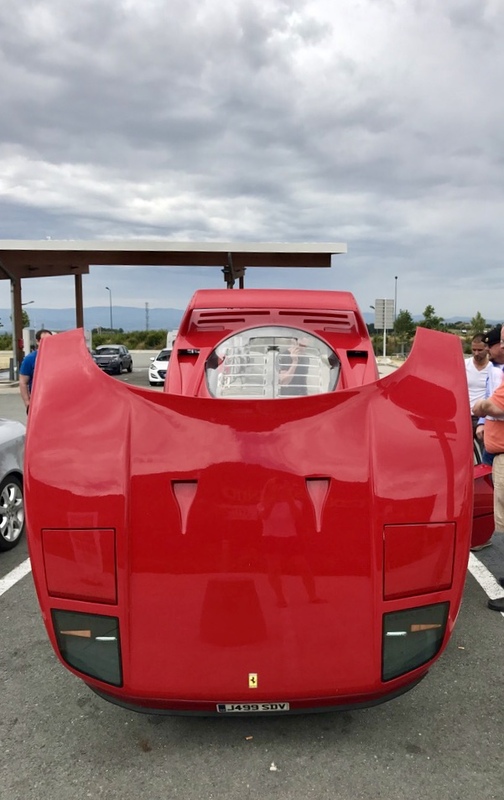 The usual crowd draws thick – after all, how often to you see a Ferrari F40, Ferrari 575, Porche GT3 and a Porche Cayman R lined up across 4 gas pumps in the middle of no-where in France? While the French may not ‘value’ investing in super cars the same way say the Swiss or Italians do, they certainly know their cars. However paying for gas in France is always a ‘cluster f**k if you are using foreign credit cards. How can they turn something so simple into something so complicated? Through the walkie-talkies we could hear ‘engines on’, ‘good to go’ and then discussions on who would be sweeping or leading the pack. My dear husband added ‘ sh*t, the car won’t start’! The guys parked their cars and came over to help push the F40 from the Gas pumps over to the parking spot ahead. We opened the engine cover & the front clam shell. This rare site only served to attract more people. What the heck was going on? Was it a dead battery? Check … nope. What about a dead starter motor? …no, not that either… Must be a dead alternator? … nope This was getting crazy, the car had just been serviced. Memories of another holiday when we had to flat bed a Ferrari back to the UK came flooding through my mind. While the Swiss contingent phoned their Ferrari mechanics in Switzerland, SSO called his in the UK. The clouds were growing darker and the crowds thicker. After 15 minutes on the phone with the chief mechanic at Carr’s Ferrari in the UK, we tried what they suggested, carefully, step by step, and finally, the F40 came to life. It turns out the contact between the ignition and the immobilizer had failed. So there we were in a gas station in France, basically hot wiring a Ferrari F40. The main challenge going forward became, we had to hot wire the car every time we started it for the balance of the trip. The rain stopped, the sun came out and we were off. So not the best start to the day but not a disaster either. The ‘Michelin green’ roads meandered us from town to town with more turns in a mile than Texas has across a 500 mile stretch. We and the F40 were thoroughly enjoing it. The route took us 450 km through Levernois, Autun, Digoin, Vichy, Ambert, La Chaise Dieu, Allègre, Langeac, St. Flour, Chaudes Aigues. There were hair-pin turns that I could barely capture on film. It was one of the best driving days we had. and by 6pm; we could see our castle in the distance. A long, winding & windy swept road took us there. When we arrived, the wind was still howling and the rain still pouring but the hospitality was invitingly warming. It was actually more like a Michelan Restaurant with 4 over-night rooms than a hotel with a restaurant. Don’t get me wrong, they were contemporary, state of the art hotel rooms. The view from our room of the mountains & the storm was amazing. A quick change from driving shoes to dinner attire and it was time to meet for cocktails. With thunder & lightening around us, we toasted the day and just how lucky we all were. We agreed on the Tasting Menu wit the recommended Wine Pairing – so no decisions to make. While this might have spared SSO’s brother from choosing the wines, I am not sure it was any less expensive. After the ‘amuse bush’, we had a tour of the kitchen; it was impeccably clean and organized and the Chef and his sous chefs were proud & passionate about their work. The food was presented exquisitely, the flavors were extraordinary, & the wine pairings were spectacular. Please share. Buttons above on the left. Also please subscribe for email updates. Sign up is on the bottom right of the landing page.